Uploaded: November 10th, 2015 03:10. 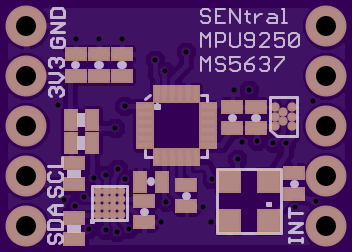 Reference design for the EM7180 sensor hub and MPU9250 9 DoF motion sensor and MS5637 pressure sensor. SENtral manages the sensors providing quaternions, Euler angles, linear acceleration, gravity and drift-compensated altitude at 400 Hz update rates. Master I2C bus and SENtral GPIOs broken out for addition of external sensors.